62 Mrs Eugene Hart was sick with the small-pox and Mother and Father had both been exposed to it. I went right home and began to pack up my things. I worked till real late to pack my trunks. I wrote a note to Billy Reed and a letter to Owen. 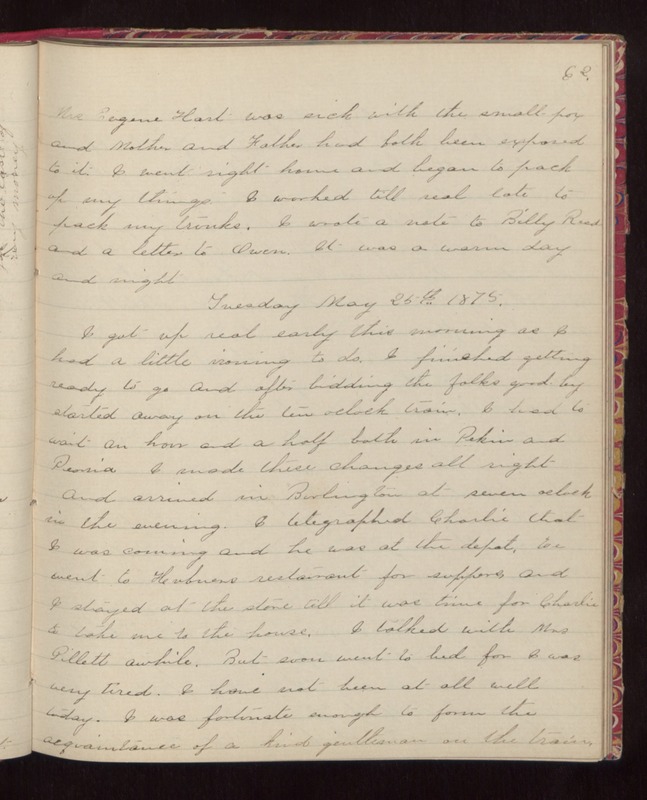 It was a warm day and night Tuesday May 25th 1875. I got up real early this morning as I had a little ironing to do. I finished getting ready to go and after bidding the folks good-by started away on the ten oclock train. I had to wait an hour and a half both in Pekin and Peoria I made these changes all right and arrived in Burlington at seven oclock in the evening. I telegraphed Charlie that I was coming and he was at the depot. We went to Hubners restaurant for supper and I stayed at the store till it was time for Charlie to take me to the house. I talked with Mrs Gillett awhile. But soon went to bed for I was very tired. I have not been at all well today. I was fortunate enough to form the acquaintance of a kind gentleman on the train.